Also known as Department Codes. Job Codes, or as we refer to them Department Codes, allow you track the amount of time your employees spend working on a specific job, or for a particular company throughout their workday. If an employee needs to change job codes during their shift, they can easily punch into a different code. All time that spent on each job can be viewed in each employee’s time card as well as on your reports. Once you have created a code, assign it to your employees. When they go to punch in they will be able to select the code they’d like to punch in to. The time spent at each job code will be reflected on the employees time card and in your reports. If you want to keep track of how much time an employee has spent at each job, you can easily view this on the employee’s time card. The time spent at each job will also be available on your reports. Did your employee accidentally punch into the wrong job code? Or perhaps you added a new job code and want to update an existing punch? You can do this directly from within the employees time card. 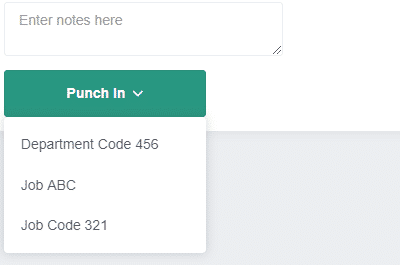 It is as easy as editing the punch and choosing the new job code. The Revision History keeps track of who made what changes. If you are a business that needs to track time by job, then our Job Costing feature can help you achieve that. You can create as many jobs, companies, or labels as needed. 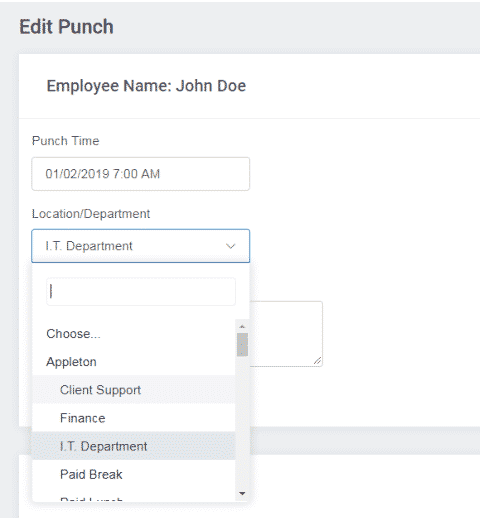 When your employees go to punch in, they will be able to select the job they are working on. Employees can easily switch between jobs as needed throughout their shift. Not only will the time spent on each job be reflected on the employees time card, but also on your reports. With our Job Costing feature, you can easily determine how much time and manpower was spent on a particular job to help you budget for the future.